With another year upon us, now is an excellent time to ensure you are prepared for your most successful year ever. What are your goals for 2019? Where do you want your business, your associates and your firm to be when you sit down next December and take stock of the year that’s passed? What can you do now to increase revenue in your business this year (and the years that follow)? One thing you can do right now, is to spend a few minutes devising a plan to grow the future rainmakers in your business. As your associates’ prowess in cultivating and marketing to a robust network increases, you will benefit from working with a group of likeminded rainmakers focused on revenue, client satisfaction and quality service. You are probably familiar by now with the steps you should be taking to think and act like a rainmaker. From having a forward-thinking business development plan to consistently devoting time to developing and deepening your professional relationships and working your system to get the most out of every contact you make, you know how to maximize your marketing time. If you need a refresher, Rainmaking Made Simple and Relationships Are Everything both by Mark Maraia, as well as our newsletters, are full of great information. Does every member of your business have a business plan for 2019? The sooner your colleagues begin to think like rainmakers, the sooner they’ll start to act like rainmakers. What could be better than being an expert at bringing in business? Having a whole firm that understands the value of thinking strategically about three key things: how they can create a business that will appeal to their ideal client, how they can build relationships that stand the test of time and how they can put into place today, habits that will support them as excellent rainmakers tomorrow. When your associates begin collaborating and interacting with your clients, mindful that their work is more than merely an assignment, but instead is an opportunity to further strengthen the relationship you have with that client, their work will improve and your enjoyment working with them will increase. Colleagues who have a rainmaking mindset bring more value to the table in every interaction they have with the partners they work with and the clients they work for because they fundamentally understand that every client is a relationship that must be nurtured. 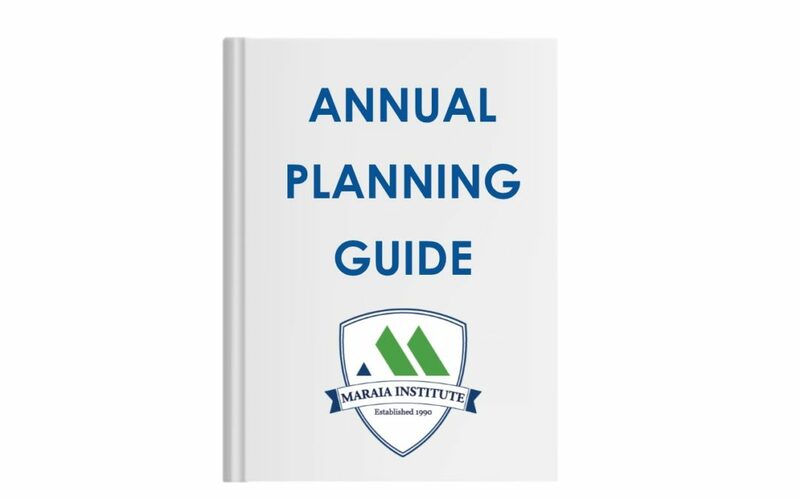 Our Annual Planning Guide is designed to help you and your entire firm start out the new year on track for success. In the last 25 years we have seen firsthand the success of professionals who take the time to strategically plan—and the frustrations of those who don’t! Considering that most professionals will likely spend over 2200 at work this year in the pursuit of their career, according to Yale Law School’s “The Truth About the Billable Hour,” devoting the next 30 minutes to planning how to get the most out of those hours in terms of revenue, career satisfaction and growth is time well spent. Setting yourself, and your team, up for rainmaking success in the coming year will ensure you stay on the path to revenue growth. Need additional help shifting your colleagues to a rainmaking mindset? Check out our newest offering at maraiainstitute.com, our e-learning academy that distills the time-tested Maraia Method® approach to business development in a fresh, engaging and efficient OnDemand format. Subscription-based, the Maraia Institute is the ideal way to bring proven rainmaking tools and techniques to your associates in easy-to-digest digital modules that are short and highly practical. No more hours away from the desk attending workshops or learning more than can be applied in a meaningful way. This is a proven, practical and action-oriented learning platform. Let us help you train your associates so that your practice can benefit from having not just one rainmaker growing revenue, but a whole stable of relationship experts who know exactly what it takes to grow relationships into a robust business.